The Marlborough bedroom range is a high quality collection of pieces crafted from solid American oak finished with a beautiful waxed finish. The bedside table has a classic look, fitting perfectly into a variety of bedrooms. This Marlborough bedside table is the perfect height for your bedside, putting your essentials within easy reach. The single drawer offers you concealed storage space, allowing you to keep the surface top neat and clutter free. The larger open cupboard space provides you with the perfect place to display decorative items or books and the generous top surface provides you with plenty of room for an alarm clock, bedside lamp and a morning coffee. 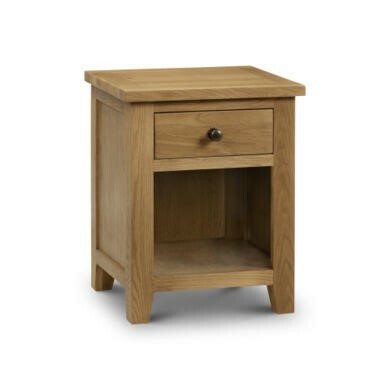 The Marlborough bedside table has been constructed from solid American oak which gives it an instant high quality look. Finished with a smooth waxed finish, emphasising the beautiful natural wood grain. This bedside table has a classic style with a versatile finish making it the perfect piece to coordinate perfectly in many different bedroom settings. It couldnt be easier. This bedside table is delivered assembled, taking away all the stress. This bedside table is constructed from solid American oak and finished with a warm waxed coating to protect the surface and accentuate the natural wood grain. The drawer base and back panel are thick plywood. Complete with contemporary round metal handles.